Cecilia forest parking at the top of Hohenort Ave just off Rhodes Drive. Ready to start at 6h30. Please come 10 mins earlier to sign the register and for a run briefing. To be disclosed at Registration. No Dogs allowed on our runs . Our weather outlook – 23 degrees and windy. RV in the Kloof Neck parking area 06:25 ready to start at 06:30. The route this week is up Woody Ravine. 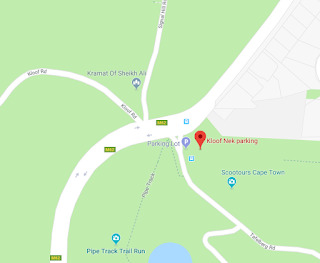 We will be meeting at the Kloof Neck parking area at the bottom of Tafelberg Road. We warm up along the undulating pipe track until we reach the turn up to Woody Ravine. We then take a steep climb of 800 m above sea level to the top of the mountain where we can stop for some great views, and a group photo. After a short run along the top, we turn down Kasteelport, back along the pipe track to the Kloof Nek carpark. Please remember this a pack run, so we try to stay together (if numbers allow we do usually break into different pace groups) but do look to make sure the runner behind you is not too far behind and has seen a turn in the route. To beat the heat please RV in the parking area 06:25 ready to start at 06:30. A mix of jeep track, single track and a steep climb up the Ravine. Relaxed Group to be confirmed. A whistle, water (extra important in the heat), a waterproof/windproof top, space blanket and ICE tag or card. Looks like we'll have a chilly start but will soon warm up. The route this week is the City Bowl side, doing a variation of the old and new VWS (Volunteer Wildfire Services) short route. As the gate for Deer Park only opens at 07:00, we will be meeting at the Kloof Neck* parking area at the bottom of Tafelberg Road. We warm up with a lung busting climb up the Kloof Corner steps. We then get to stretch our legs and take in the full glory of the waking CBD as we run along the front face contour path above the cable station. We turn down before we get to Platteklip Gorge (unless we miss the turn off in which case we run down Platteklip Gorge) to Tafelberg Road. We turn right on Tafelberg Road and take in a little tar before we turn down left into Deer Park. After a little loop above the 3 Towers we head back through Deer Park (be aware the "up" is not done yet) returning to Kloof Neck parking. A mix of jeep track, single track and a touch of tar.